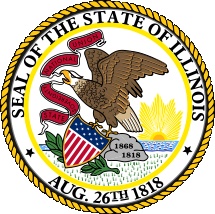 The Illinois Department of Public Health (IDPH), Division of Vital Records, does not issue certified copies of marriage records. For a fee and with proper identification, certified copies are available from the county clerk in the county where the marriage occurred (http://www.idph.state.il.us/vitalrecords/countylisting.htm). Illinois marriage records are available from January 1962 through the present. The division does not issue certified copies of dissolution of marriage records. Dissolution of marriage indexes may be searched only by the husband's last name. Verifications of Illinois divorce records can be obtained by mail, by fax or in person. Additional information on how to obtain certified copies of Illinois vital records is also available via the Illinois Department of Public Health website at http://www.idph.state.il.us/vitalrecords/. Note: State will verify marriage or divorce from 1962-present, but will not issue certificate. Records of marriage and divorce are found at the county of issue. Search Note: Verification requests must be in writing. Note: Except for certain online research capabilities, all trial court record access must be done at the local level. There is a support and enforcement office located at 222 N. LaSalle - 13th Floor, Chicago, IL 60601, 312-793-3250. Record Access Requirements: Requester must use the Uniform Conviction Information Form ISP6-405B. Personal requests are honored per Illinois statute. 100% of arrest records are fingerprint supported. Search Note: Fingerprint cards are an option; a fingerprint search using Form ISP6-404B is recommended in order to assure proper identification. All forms can be ordered (but not downloaded) at the website. Maiden names must be submitted as a separate request, fee. Note: Offender information is available to the general public and private organizations. Record Access Requirements: Records are never destroyed, but are archived. Search Note: Location, conviction information, physical identifiers, and release dates are reported.